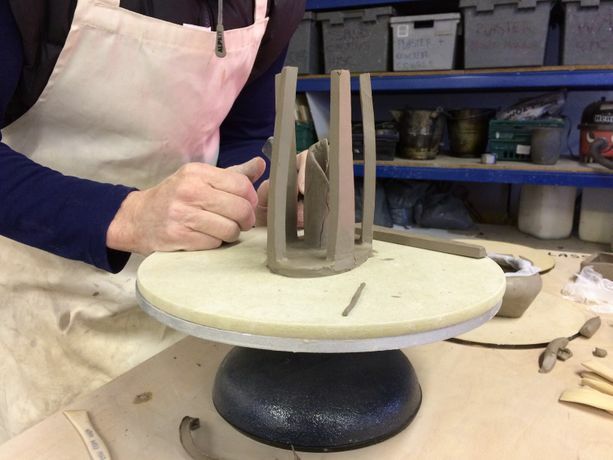 This is an ideal course for those who have attended our ‘Introduction to Ceramics’ course. Or if you have some previous experience in ceramics, and wish to develop your skills and understanding to create larger, more complex forms. Students are encouraged to come with ideas of what they would like to make. Please bring a sketchbook and any useful reference material. There will also be some books and images provided as inspiration. You will be supported in making through group demonstrations and one-to-one guidance. Over the weekend you will learn how to develop and refine your handbuilding skills. You will have the opportunity to add colour to your work with oxides and slips, and use many different slip decorating techniques, including sgraffito, slip trailing and in-lay. Surface texture, imagery and pattern can also be created using a variety of tools, including stamps and sprig moulds. Please note: Per person the course price includes 6 kg white earthenware clay, slip (5 colours), glaze (white and transparent) and two kiln firings per. objects made. It is possible for students to purchase clay during the course. Additional clay will be charged at £4 per 1 kg of fired work. Work should be paid for on collection (cash only). The scale of the work may be limited to insure all work fits into two kiln firings. Students will be notified by email when their work is ready to collect. This may take up to a month depending on the workload. Work may be damaged during the firing process. Please wear appropriate clothing. We do provide aprons.